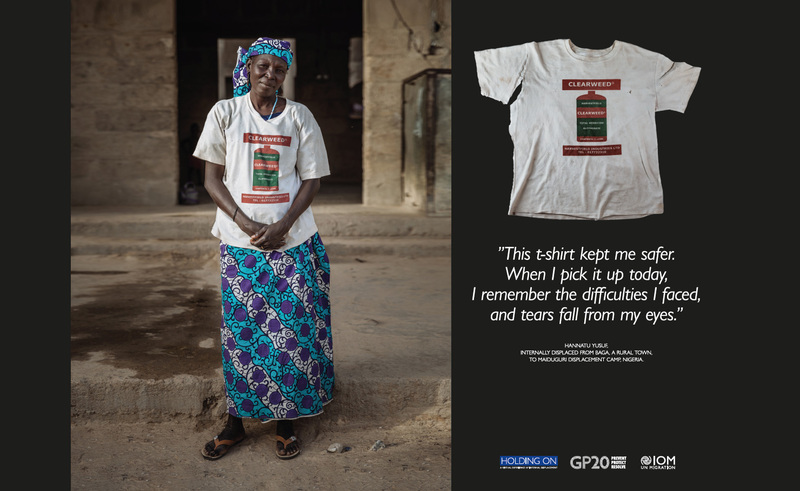 The Hague – The UN Migration Agency’s Holding On exhibition showcasing the stories of internally displaced persons (IDPs) by asking them to reflect on their most cherished possessions was featured at a G20 event on the Financial Inclusion of Forcibly Displaced Persons (FDPs) which opened on 10/09 in The Hague. The goal of this two-day event is to develop a set of guidelines to support the financial wellbeing of those who are forced to migrate in order to escape situations that endanger their lives, freedom or livelihoods. Over 68 million people had been forcibly displaced by the end of 2017. Providing these individuals with adequate access to financial services has long been recognized as a challenge by governments and international stakeholders; however, options to carry out day-to-day financial transactions are vital for FDPs. Under the German G20 presidency, financial empowerment of FDPs was set as a key priority of the Global Partnership for Financial Inclusion (GPFI); the workshop will support the development of the G20 Roadmap for Sustainable and Responsible Financial Inclusion of FDPs. IOM, the UN Migration Agency, recognizes the challenges facing displaced populations – in particular, internally displaced persons. The organization supported the Commission on Human Rights’ adoption of the Guiding Principles on Internal Displacement in 1998, which remains the most widely recognized standard to prevent, respond to and resolve internal displacement. 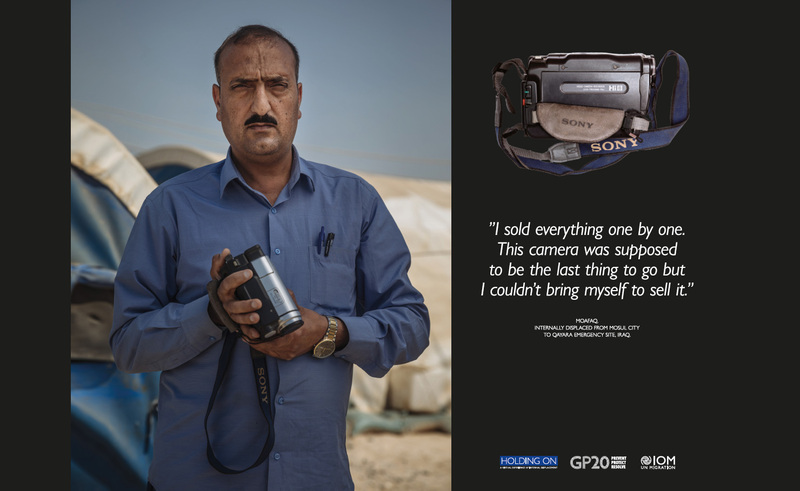 To commemorate the 20-year anniversary of the Guiding Principles earlier this year, IOM launched Holding On – an exhibition that showcases the stories of internally displaced persons by asking them to reflect on their most cherished possessions. IOM representatives were present at the high-level workshop to present this ground-breaking campaign, which allows participants to enter the “makeshift” homes and communities of internally displaced individuals; to watch them share their story of displacement; and understand the significance of the possessions they hold onto when they leave home. “The power of the Holding On exhibition is that it builds badly needed empathy for the millions of people forcibly displaced by violence and disaster within the borders of their own country," said Mohammed Abdiker, IOM Director of Operations and Emergencies. “Internally displaced people need more champions! The exhibition is working towards this goal. It uses an immersive virtual reality experience to bring viewers into the homes of displaced people, revealing the struggles they endure every day and enlightening more and more people to their cause,” he added. The Hague is just one of the many scheduled stops for Holding On, which is a roaming campaign designed to alert global audiences to the realities of forcible displacement. Several workshop attendees – including financial regulators; policymakers from G20 and non-G20 countries; representatives from humanitarian and development agencies; as well as academic and private sector stakeholders – expressed appreciation for the exhibition and an interest in recreating it in their own countries. The workshop will encourage thought leadership and problem-solving, and consolidate views from different relevant stakeholders to collaboratively address the issue of financial inclusion of FDPs. Her Majesty Queen Máxima of the Netherlands attended the opening of this event, which will conclude today.